At least�48 people were killed and 150 injured in two blasts in south Mumbai -- one near the Gateway of India and the other at Zaveri Bazaar in busy Kalbadevi area -- on Monday afternoon. Police sources said explosives concealed in two taxis went off in quick succession -- at 1305 IST at Kalbadevi and a few minutes later at the Gateway of India. The injured were admitted to J J Hospital, G T Hospital and St George's Hospital. 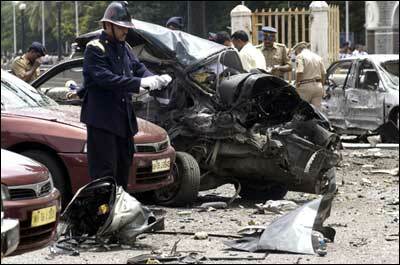 A witness told our correspodent at Mumbadevi circle in Kalbadevi that he counted at least 15 to 20 bodies. Police Commissioner R S Sharma said the involvement of terrorists was suspected, but so far no group has claimed responsibility. Details about the nature of the explosive used are sketchy. The state government has sought the help of the Indian Army's explosives expert and a team of the National Security Guards is also arriving from Delhi. The Gateway blast took place in the parking lot opposite the historic monument. The Taj Hotel's lobby suffered damage in the blast. A�witness said glass was strewn all over the place. Our correspondent counted at least 10 damaged cars at the Gateway. The entire area was cordoned off within minutes of the blast. The road leading to the Gateway from the Regal cinema building in Colaba�was sealed. The mobile network in Mumbai collapsed just minutes after the explosions. There were reports that the network was shut to prevent rumour mongering. An�alert has been sounded all over Maharashtra. Deputy Chief Minister Chhagan Bhujbal held a meeting with top police and civic officials at the government guesthouse Sahyadri and�later, along with Chief Minister Sushilkumar Shinde and Minister of State for Home Rajendra Darda, visited the blast sites. Shinde appealed to the agitated people in Kalbadevi to maintain calm. The government has announced an ex-gratia of Rs200,000 each to the kin of those killed and Rs50,000 to the seriously injured. Deputy Prime Minister Lal Kishenchand Advani is scheduled to visit Mumbai on Tuesday.